They have the education, the experience, the expertise… they’re good at what they do. But they don’t know how to sell their services… maybe they’re even afraid or ashamed to sell. But this founder of The Sales House has the antidote. He says method, training, and process has its place in sales excellence… But he also advocates another secret ingredient. 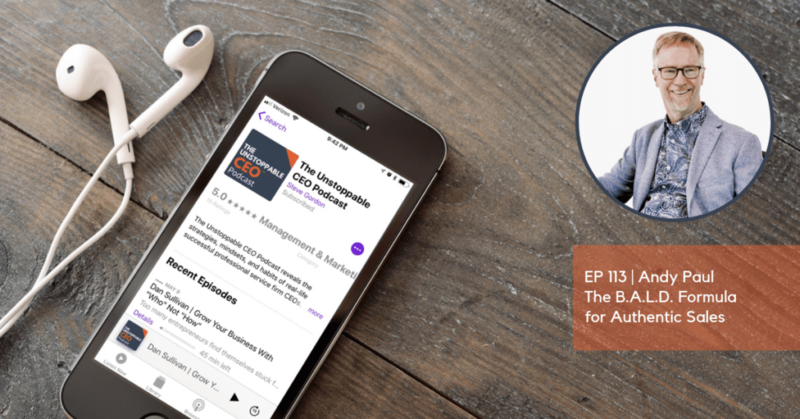 Steve Gordon: Welcome to The Unstoppable CEO podcast. I’m your host, Steve Gordon, and this is going to be a great episode today. I’m excited to be talking about sales with Andy Paul. Andy is the founder of The Sales House, the first all-in-one sales education community for modern B2B sellers and sales leaders. He created The Sales House for those B2B sales professionals who are really at every stage of their career to help them achieve readiness, relevance and resilience, and really to take their selling ability to the next level. He’s ranked by LinkedIn as number eight on their list of top 50 global sales experts. He’s the author of two Amazon best-selling books, and I know he has just a wealth of wisdom to share with us on sales. So Andy, welcome to The Unstoppable CEO. Andy Paul: Steve, thank you for having me. Steve Gordon: So you’ve accomplished a lot. You’ve got a tremendous track record in sales. Help everybody with a little bit of context around what got you to this stage of your career. How did you become a sales master? Andy Paul: Just showing up at work every day for four decades. You know, I think for me really the key over the course of my career is I’ve done so many things. My first job was with a large company four decades ago in sales, the number two computer company in the world at that point. Then my journey really swerved. In Silicon Valley and southern California I worked for eight different venture funded startups. Well, not all venture funded, but startups, primarily in the tech space. Yeah, just sort of rose through the ranks as I gained more experience. For me it was all about continuing to learn, because I was a liberal arts major coming out of college and worked in some fields that required some pretty deep technical expertise, and I was certainly capable as a lay person of the technology, but even each of those steps along the way I was selling to a different type of account, oftentimes a larger account, so my career arch was sort of selling computers, mini-computers, sort of $25,000-$30,000 worth, to the time I finished before I started my own company in 2000, where I was selling communication systems worth millions of dollars to some of the world’s largest corporations. Steve Gordon: So, you’ve been in sales for four decades. You’ve launched The Sales House. You’ve done all sorts of things in selling. I know that that’s not always an easy process. It’s not always instant and immediate and easy success. So, as you reflect back over the four decades you’ve been selling, what are some of the ways that you have kind of stayed focus and remained persistent even when things weren’t necessarily going your way? Andy Paul: One was the willingness to take risks. There’s such an emphasis on sales, actually an increasing emphasis unfortunately over the last 15 or 20 years on sort of methodologies and process and being sort of conformed to a certain way of selling and … Yeah, I’m a believer in sort of the exact opposite, but … Yeah, it’s good to be grounded and trained in method and process, but at the end of the day everybody develops their own unique style that plays to their strengths, and we need to enable the people that work for us to go out and discover what those are. I was fortunate enough to work for some managers, some bosses that encouraged me to take some risks, to try something a little outside the ordinary that I thought would work for me based on my strengths, and, you know, there was always a downside risk. But on the other hand, is unless you went out and really tried, you’re never going to see what’s possible on the upside. So for me that was a constant experimentation, learning as much as I could, reading as much as I could about sales, listening to people I thought were really smart people about it, and taking the nuggets I could and saying oh yeah, that sounds like that would work for me. Let me go try that. Steve Gordon: This conversation we’re going to have today is going to … For a lot of our listeners is going to hit I think a real chord with them, because a lot of the folks that are listening are in a professional services business. They probably went to college and got educated to go and practice their profession, and during that entire time sales never came up. Five year, eight years in school and nobody ever mentioned sales. But then the minute that they got out and realized wait, I got to pay the rent, I got to figure out how to get a client, it all kind of changed. And I know for a lot of them it makes them probably a little bit uncomfortable. In other words, it looks to them like taking a risk. So as you approached each of these moments where you had to take this risk, where you had to take that next step, what did you think about? What did you use to kind of push through that? Andy Paul: I think it was a degree of self-confidence that I was going to find a way. I’ve certainly … We’ve all had failures in our career, and I’ve worked for companies that have … You know, startups that didn’t make it, as many don’t. But I’ve always had this belief that, you know, if I kept on learning, if I kept trying to put myself in a position where I could succeed and do something really interesting, that I found really interesting, that I would make it work. So for me that persistence has come with self-confidence, but the self-confidence I just didn’t pull it out of the air. I was still investing in myself, and I felt as long as I was investing in myself that I was going to put myself in a position to take advantage of the opportunities that presented themselves. Yeah, I think that’s really important to keep in mind. You really are … You want to have a sales plan and you want to have a marketing plan, but as much as anything you want to make sure you’re prepared to take advantage of the opportunities that present themselves that maybe you haven’t counted on, and for many small businesses that’s how they experience rapid growth, is that sort of unexpected opportunity came around, they were prepared, they seized it, it forced them to master some new disciplines, but put them in a different position to address maybe a bigger market, a different market, something they hadn’t really anticipated. I think even for the solopreneurs the same thing is true. Steve Gordon: Yeah, without a doubt. And you never know where that’s coming from. Andy Paul: Well it’s this element of luck that people talk about. People hate talking about luck, because I think it means it was lucky … I think what the luck comes is the luck comes in the form of the opportunity. You still have to execute. I’ve never had anybody just hand me a piece of business or a large order and say, “Hey, here you go,” out of the blue. I may have had some opportunities present themselves for sure that I wasn’t counting on and then I had to make a decision. I was like okay, is this going to be worth the distractions or worth the time and effort that’s a little outside the ordinary? But then you sort of say okay, I got to think a little bit to get through, and it’s like yeah, this could be an interesting opportunity, an interesting growth opportunity. Let’s go for it. So, I think … That I think is the key to success. We all heard the expression, but my dad always used this one, the harder you work, the luckier you get, and I’ve always embraced that. Steve Gordon: For me it always comes down to the idea that … And I think this fits with what your dad would say. When you’re working harder, you’re creating more at bats for yourself, more opportunities to get up there and try and make something happen, and I think that’s really critical. One of the things that I know we see a lot, particularly with smaller businesses, is that … And I want to talk about this more as we talk about what you’re doing in sales, but they just don’t give themselves enough opportunities to really hit the level of success that they want to hit. They don’t understand how much is necessary, particularly early on in a business, to really get out there. So I think that’s a key insight for everybody listening to kind of note. Andy Paul: Well, there’s sort of conflicting forces at play, because on one hand people will tell you, and this certainly makes sense, is you want to be able to identify your niche as much as possible. But I think that there’s … At least for me, in my experience, there’s always been a sort of step before that, which is … You know, it takes some exploring to find that niche. And again this willingness to have an open mind, to say okay, well maybe it’s not exactly this … I mean I always look back when I started my company, and anytime I start something new it’s like it takes a while to find out what people are willing to pay you for, right? Andy Paul: And it takes a little bit of exploration, a little bit of risk taking to really find that initial sweet spot. And then again keep your mind open, because another one may come in that’s, you know, parallel, or even perpendicular to that that may make perfect sense for you. Steve Gordon: Yeah. And I think, you know, kind of going back to your original thought there of the harder you work the luckier you get, particularly in the early days of a business the more conversations you’re having with people, the more people you’re in front of, the more feedback you get about what’s really valuable, where the niche really is, all of that, so I think that all fits together really well. I want to take a quick break. We’re going to come back and dive into some specific stuff around sales, so we’ll get right back with more from Andy Paul. Welcome back everyone. This is Steve Gordon. I’m talking with Andy Paul. He’s the founder of Sales House. Andy, I want pivot our conversation a little bit. I want to talk about the work you’re doing in Sales House and how you’re really helping business owners kind of get their … Whatever level they’re at, kind of get their sales skills and their sales results to the next level, so can you give us an overview of what you’re doing there? Andy Paul: Sure. The premise of starting it came from, again, all my experience of trying to grow sales teams, as well as my own capabilities over my career. What I found is it was much more a function of constant learning and self-education and self-development, as Brian Tracy talks about it, as opposed to formal training. It’s beneficial for companies to invest in some training for their people, but quite honestly, it’s never enough. So individuals have to take on some responsibility for their own development and companies have to really think differently about they’re educating their people. So, The Sales House is based on this model, is we want people to spend 10-15 minutes every day learning something new that can help them grow, grow from a personal and professional standpoint, and grow revenue, grow their sales. So we created this sales growth engine we call it that is a combination of course and live coaching that we do multiple times a week that I host, and a very engaged community on a Slack platform we use, and hundreds of hours of content that people engage in to just get a little bit smarter, a little bit better every single day. We think if people just engage and learn in small bites that the cumulative effect, and I’ve certainly experienced it in my career, the cumulative effect is very powerful. So, it’s a way for small and mid-sized enterprises that don’t have a training function to say okay, here’s something we can engage for our people, so we can see if they engaged with the content, but see if this is a resource that could really help them. We’re absolutely a believer that this is the way that people learn, that people learn best. And certainly we’re going to see more and more learning and formal training going forward in the future, and sort of the micro-learning people are calling it. But it’s just something that doesn’t really exist out there in this form, so we’re getting a lot of individuals join, a lot of solopreneurs, as you talked about, people that are in a profession and didn’t realize that sales was part of it, as well as smaller enterprises that are saying this is a great resource to enroll our people in because they get attention that they wouldn’t necessarily get from the company, as well as access to course and learning that’s, again, not available anywhere else. Steve Gordon: We certainly have a lot of folks who are in that solopreneur category listening. But I’ll tell you, the ones who I know are feeling the pain are the smaller firms, where they’ve grown, they’ve got maybe a founder and then the founder has gotten the business far enough along where they’ve brought in some junior associates or junior partners, and those people now are growing to the point for the firm to get to the next level they’ve got to become producers. In law they would call them rainmakers, but they’ve got to be able to go out and develop client relationships. And, again, these people are just like the founder in that they got out and suddenly now they’re being told you got to sell, but that’s a new term for them. So, thinking about that kind of a firm, because I know that owner is feeling that pain, where … If they’re listening, thinking I really need to get my people started down this journey. They’re not going to be the next Brian Tracy by the end of the quarter, but how do I get them moving down the right path, where would you start? Steve Gordon: That was the easy answer, right? Andy Paul: Yeah. But our perspective is different than almost anything else you’re going to see on sales, which is that I believe that sales is a service that you provide to a customer. Oftentimes people who are not salespeople by background and by training, this is the mindset that they haven’t really thought about before that sort of prevents them … Because they think that it’s something that they’re doing to somebody, right? I’m selling to someone. Andy Paul: That’s not what sales is. Effective selling is a service you provide in collaboration with your buyer, with your customer. So what I focus on in the curriculum in The Sales House and in my books as well is the human sales skills. It’s how do I connect with someone? How do I make that first connection? How do I engage their interest? How do I start building the level of trust required, and then ultimately how do I work with them to inspire them to take that final step and say look, I want to do business with you? I’ll just give an example on things that are sort of the cornerstone of this method, this philosophy, an acronym, and I tend to reduce things to acronyms to keep it easy for people to remember what to do in the moment. One of the core acronyms is BALD, B-A-L-D. These are four core human sales skills that if you can master these you could form a relationship pretty easily with anyone, whether it’s in business or in life. Just running through the acronym real quickly, the B stands for be human. It’s about demonstrating your curiosity, having respect for their time, being focused in the moment. A stands for ask great questions. L stands for listen slowly, and the D stands for deliver value. Be human, ask great questions, listen slowly, deliver value. So, when you think about it from beginning a connection with a potential new prospect, a new customer, is there’s an implicit bargain that’s struck. The bargain is the customer is giving you some of their time to talk to you. What are you giving them in return? And if there’s nothing exchanged in return, nothing of value for the buyer that helps them make progress toward making their decision, then you’re not going to get any more time. So, when we talk about being human, asking great questions, which is instead of talking about yourself be curious about them. Demonstrate an authentic interest in someone else. It’s the most effective way to make yourself interesting to them. Listening slowly is that … Oftentimes, especially if you’re a little nervous in a sales situation, you’ve got your set of questions that you’re going to ask. When you ask your first question you’re already thinking about the second question you’re going to ask. You’re not really listening to what the buyer or telling you or the potential client is telling you, so you got to build in … What I teach is you build in a physical pause to make sure you’re actually listening to what they’re saying. That third one is just every time you interact with the buyer or the customer you have to deliver something of value that helps them make progress toward making their decision. So, it’s four very simple things in this acronym, BALD, and that’s the approach that Sales House is built around. Really it’s not the tools, it’s not the technology, it’s not the service you sell. Ultimately it’s you as the seller that is the big point of differentiation. How you approach that initial contact, how you build those relationships is really ultimately what’s decisive. Steve Gordon: I love that. I love how simple it is, very much in line with the way we approach marketing, and I think very easy to implement for anyone. Steve Gordon: I want to ask you a question about a particular part of the sales process, and this is a piece of it that I know a lot of people get stuck on, because they can look at that acronym and go okay, I get that. When I’m in front of a prospect it’s simple enough. Hearing your description, I think they could come close to executing it, but the question then will be how do I get in front of a prospect? Who are my prospects? So how do you address prospecting in this process, or how would you advise a client of yours to begin to go about prospecting? Andy Paul: Well, first of all you have to look in the marketplace that you’re addressing as to who is your ideal client profile. You have to identify what that company, that individual, whatever the target is you have. So do the work to define that ideal client profile and then use some of the tools that exist that are easy to use to start building a position in the marketplace. This is something I think is a requirement for a big enterprise, small enterprise, solopreneurs, is what do you care about that’s important to your clients? So it could be as simple as hey, I’m going to go on LinkedIn and first I’m going to create, you know, an interesting profile, assuming I have an interesting professional profile, is I’m going to start sharing content of other people that I find interesting. Then maybe I might progress to I’m going to start commenting on that content I find interesting, which then may progress to I’m going to post my own opinion here occasionally. Because I guarantee you, especially in the business to business world, is if you’re selling to a client when you contact them, the first thing they’re going to do when they hang up is they’re going to look at your LinkedIn profile and they’re going to say what does this person care about? What do they think about? What’s their point of view? So, my urge to people in the solopreneur world or smaller, put that out there. What do you stand for? Who are you? What do you care about and how does that relate to your clients? That’s just sort of one step. We could sort of go on to other steps beyond that in terms of if you’re a local market how you make contact with people, whether it’s through email follow-up, cold calls, networking events, but you have to put yourself out there with a point of view. I think this is what differentiates people who do this effectively from those who don’t, is that when people look at them online they say they’re interesting, and that gives you a leg up. Steve Gordon: … and it costs the same either way. Andy Paul: Yeah. I mean our company, there’s two of us now, but it’s virtually been one for most of the time I’ve had my own company, since the year 2000. Yeah, and I’ve got 170,000 followers on LinkedIn. Why? It’s because I’m putting myself out there. I’m publishing content. I write about things that I care about, that they would care about as well. You start building up a brand and a reputation, and that’s what everybody needs to think about, is even as solopreneurs you have to build a brand. Steve Gordon: And I know there are going to be some people who are thinking they heard 170,000 followers on LinkedIn, they go oh well, it’s easy for Andy. He’s got 170,000 followers on LinkedIn. Andy Paul: I started at nothing though. Steve Gordon: Like everybody else, right? You logged in, you created the account. It didn’t come with 170,000 followers? Andy Paul: No. No. But they’ve all come in the last five or six years, when I sort of reinvented myself about six years ago. I had had a consulting business for about 10 to 12 years and I moved from southern … I got married and moved from southern California to New York City, where my wife lives and works, and had to sort of start over, so that’s when I started down this path of writing my books and doing the podcasts and eventually starting The Sales House. Yeah, I virtually had none a handful of years ago, and so anybody can do it. If I can do it, certainly anybody else can do it. You just have to have the willingness and the desire and just have the persistence to stay with it and find your voice. But again, when let’s say you’re a solopreneur and maybe you’re selling accounting services in a local market, there could be two dozen people that are your competitors. In your client’s mind’s eye you all look alike unless you do something to differentiate yourself, and having a point of view, showing that you care about something, showing this is how you would approach it or how you think, that’s information that sets you apart from your competitors. Steve Gordon: Yeah. You know, the first time that really hit me as I was beginning to get a marketing education back when I was in engineering and we were exhibiting at a trade show and I was walking in the morning to the booth. They had just opened up for all the vendors to walk in, and so it was quiet in there, and I was walking down the rows of booths and it hit me like a ton of bricks. If you covered up the logo on all of those booths, including ours, you wouldn’t know which company was which because they all said essentially the same thing. It might have been rearranged in a different order, but it was all the same bunch of nonsense, which was probably meaningless to clients. That was like the moment, I went like oh, we got to start thinking radically differently about how we’re going to approach things, and I think your point is right on the mark for most businesses. You cover up the logo and the name and you can’t tell which one it is in any local market, even in any big market. Andy Paul: Yeah. At the end of the day it’s … You know, as much as we want to take pride in the products and services we sell, as much as anything people are buying us as individuals, or as your salespeople, they’re representing you. This is why it’s so important to get the right people and set the right culture up in your company if you’re starting a small business and you’re starting to hire salespeople, because people are buying that individual primarily more so than your company. Steve Gordon: Yeah, I think very much so. I think that’s the first sale that’s made before any money changes hands. Andy Paul: Oh yeah. Absolutely. So that’s what I’m known for in sort of the sales profession. People write about this widely, is Andy is sort of the human sales skills guy. And for me, because that’s constant, again tremendous amount of really interesting tools and technologies coming into sales, artificial intelligence driven tools, and they’re all useful, but at the end of the day the person is still buying from the person. And you have to be a master at those four core skills that I talked about, BALD, be human, listen slowly, deliver value. You do that, you’re always going to stand apart. Steve Gordon: Yeah. Absolutely. I imagine there are some business owners who are listening to this thinking okay, I’ve got a problem now. I know about the problem I have. Where do they get started? Obviously Sales House I’m sure is going to be a great solution for them, but even if they go and they check that out and they become a client of yours, where do you think … If they’re starting kind of at the beginning, where should they go first? Andy Paul: Yeah. Within The Sales House we have a core course we call The Foundations of Sales Growth. This takes somebody through … It’s an investment. It’s six and a half hours of the basics. It’s to get you the grounding, the foundation to say okay, if I can master these core skills, these core mindsets, these core values, that this is going to set me up for future success. So, we really start right at ground level and start building sort of this pyramid, if you will. That’s what all of our new members go through when they first come on. Then they get involved in the coaching on a weekly basis in our community. We have a very engaged community, a lot of great interaction between members, because I’m just one head and I always think many heads are smarter than one, so getting group input is really important. But yeah, just people come in and they start The Foundations of Sales Growth and it’s just a way to sort of accelerate the rocket ship to start off their journey. So, if people are interested, I urge your listeners to contact me directly at andy@thesaleshouse.com. I’ll answer any questions you have about it. Or if you just want to check out the site you can go to thesaleshouse.com, and I look forward to taking to people. Steve Gordon: Yeah. Well, I’ll tell you, I used to have that attitude myself. I mean the person that I described to you earlier was me about, I don’t know, 15 years ago. Then I realized a lot of the things that you’re talking about and your approach, which there are certainly others who talk about this idea, that selling is really a service that you offer, somehow or other I stumbled upon that and it all began to make sense. So I love the approach and … Go ahead. Andy Paul: I think for people listening too, another perspective to think about, especially if you’re a solopreneur, if you’re a service provider of any sort, I mean think about your motivations for wanting to be in that business. To some degree I’m sure it’s because you want to help people and help them solve certain problems, help them achieve certain things in their lives and in their careers. Well, to me that’s the fascinating thing about sales, is it’s sort of a contradiction I think for some people if they don’t like the idea of doing it, but it opens the door to meeting really interesting people that you have the opportunity to help. So, I think if you have this innate curiosity about people, which you obviously do if you’re in a people-based service profession, selling is just part of that, and you don’t have to think about it that way. This is one thing that’s always kept me interested and engaged in my career. I’ve been fortunate in my career to sell on seven … Well, six of the seven continents that exist, everything but Antarctica, is I just met all these fascinating people, and I’ve been able to help many of them. The same thing with my podcast, 700 episodes, it’s like I’ve just met 700 really smart, interesting people. But if you have that curiosity, then that makes the selling easier. Steve Gordon: Yeah. Without a doubt, without a doubt. Thank you for investing some time with us today, and I encourage everybody to go check out thesaleshouse.com. We’re going to link that in the show notes. Andy, this has just been a pleasure and a lot of fun. Thanks for being here. Andy Paul: Well, thank you for having me. Yeah, it was a lot of fun.